The site of several destroyed sites, a large quarry between circles 27 and 32. Destroyed Monuments between 27 and 32. Four circles, which all appear to be destroyed by quarrying, were reported in this area. Some large stones, illustrated above, may be from these monuments. The notes below are from Petrie and Wood-Martin. No. 28. Situated twenty paces to the southeast of 27 (dolmen-circle). "Of this circle there is only a vestige consisting of three stones with the supporting stones of the cromleac. The destruction of this circle has been recent" (i.e. in 1837) - Petrie. "All traces of it are now gone." - Wood-Martin. Circles 26, 27 and 32. No. 29. Situated still more to the south and east of the road (dolmen-circle). "Of this circle, also, there is only a vestige, six large stones of it and of the cromleac only remaining, the rest having been recently blasted and removed. As usual, human bones were found within the tomb." - Petrie. "Nothing now remains." - Wood-Martin. No. 30. Situated to the east of 29, and on east side of the road (dolmen-circle). "This circle, with its fine cromleac, was destroyed within the last week (i.e. August, 1837) by Mr. Chambers of Cloon Hill." - Petrie. "One large stone, standing solitary, like a sentinel, marks the site of this monument." - Wood Martin. 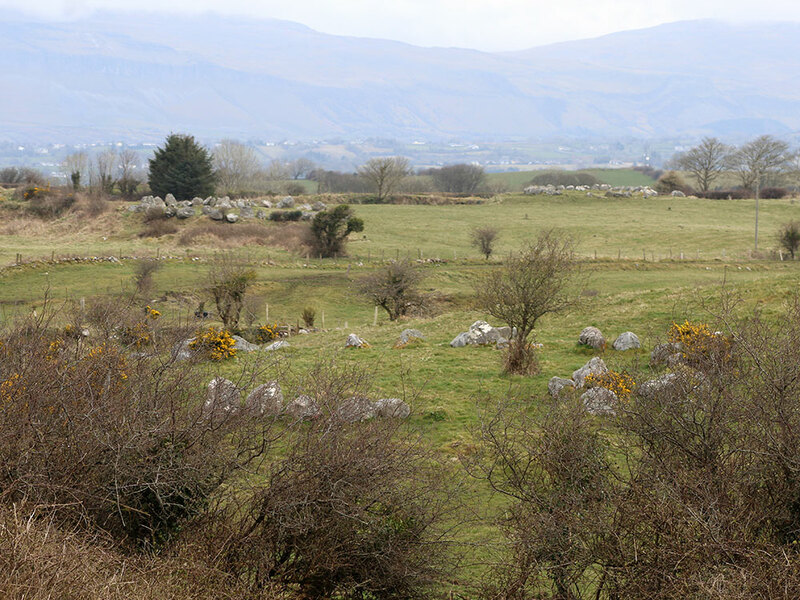 Circle 3 and Knocknarea mountain. No. 31. 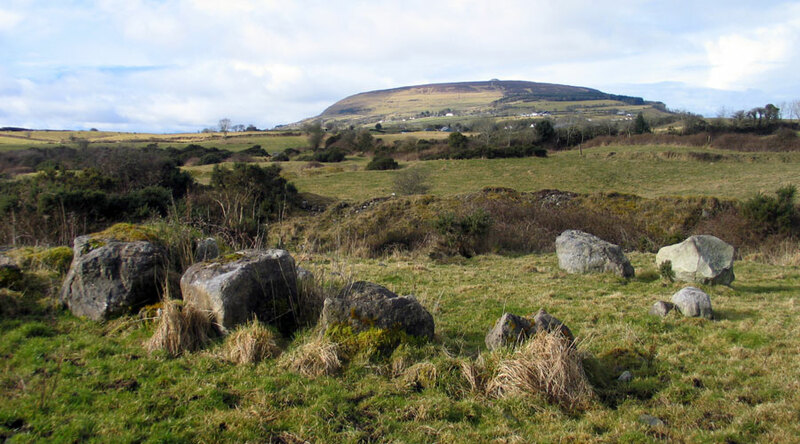 Situated on Leachtareal Hill, to the west of the road, and south of dolmen-circle number 30. "Of this circle and cromleac only a few stones remain. They were destroyed a few years ago by one of Mr. Walshe's tenants, who occupies the farm. It was of small diameter, but the stones were of great size. Human bones were found within the cromleac." - Petrie. 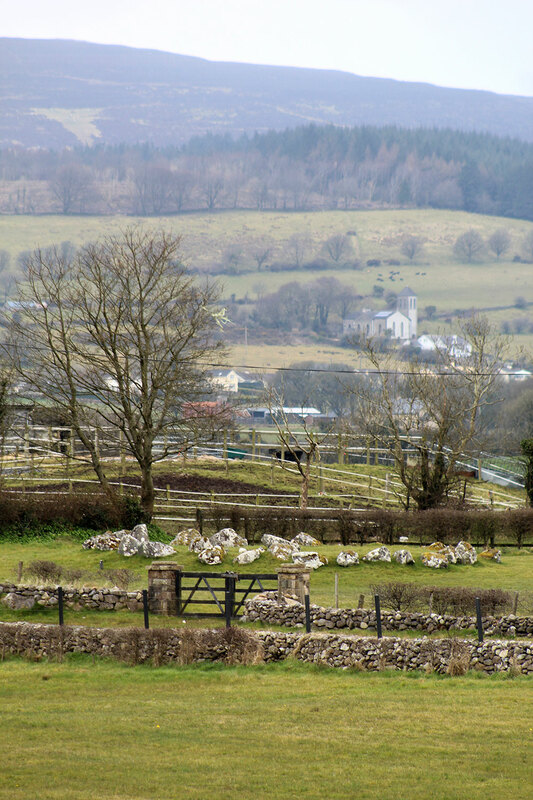 "Some of the boulders which composed this monument may be seen at a considerable height in the ditch of a garden-plot on the West side of Leachtareal hill." - Wood-Martin. Looking north to Circle 27.